Jellycat Mattie Monkey has such fantastic fur, with silvery patches and heathery spots. His big peach feet and friendly hands help him climb and jump and land, while great big smiles and long, soft limbs mean we all want to be friends with him! Did you see someone grinning in that tree? Yes, it’s magnificent Mattie Monkey! 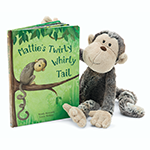 Pair it with Jellycats "Mattie's Twirly Whirly Tail" book (Sold Separately) to make a great Birthday, Baby Shower, or Just Because gift.